This is page 3 and 4 of my autumn journal. I can't resist featuring the fruits of autumn. 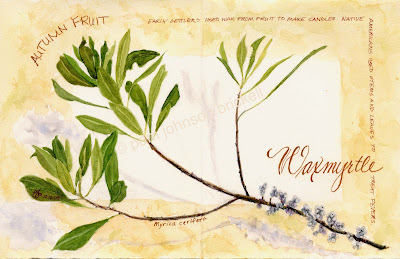 I originally planned on having 3 different sprigs of plants with fruits on this page but the Waxmyrtle took over :) One never knows how things will turn out. I love how journal pages take on a life of their own. Simple but beautiful! Am I wrong or are you using a greater variety of greens in your leaves? Either way it adds up to a striking painting. The merriest of wishes to you and yours for a happy Christmas and a great 2010! !